40th Birthday of HRH the Princess of Asturias-Official Photos, 2nd Outfit. September 2012, Madrid. Working visit to the United States-Outfit 2. June 2012, New York. On September 14, the Prince and Princess of Asturias and their daughters posed for the press at the Infantas’ school in Madrid. The Infantas wore their navy and grey school uniforms with matching Kipling backpacks. On September 13 the Princess of Asturias, honorary president of the Spanish Association Against Cancer and its Scientific Foundation, presented the association’s annual awards and scholarships in Córdoba. On September 11 Doña Letizia visited the schools and workshops organized by National Heritage at the Royal Seat of El Escorial on the occasion of their 25th anniversary. Meeting of the Hague Club. September 2012, Madrid. On 7 the Prince and Princess attended the annual meeting of the Hague club. 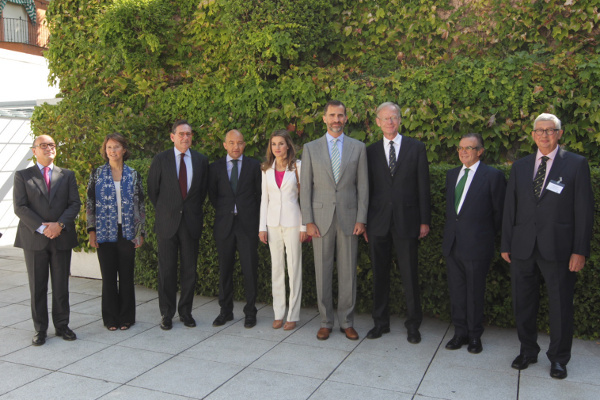 This year the meeting was co-organized by the Prince of Asturias Foundation.